Thanks to /u/Vynidaris for this sample! So I’m trying to keep up on boozing, but works crazy, personal life is busy (but good), and we’re slowly falling into the abyss that is the holiday season of crazy times and even busier times for my job. 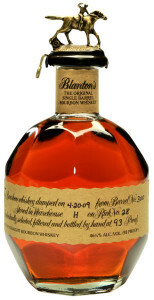 Blanton’s Original Single Barrel is what’s up today. Or at least a few days ago when I reviewed it. Yet through the magic of text, you’ll read it all as one, and it won’t seem too disjoint. So the big thing about Blanton’s Original Single Barrel is, according to ‘legend’, the first single barrel bourbon made. And these days they do the same thing, only taking single barrels from warehouse H and labeling the barrel on each bottle.